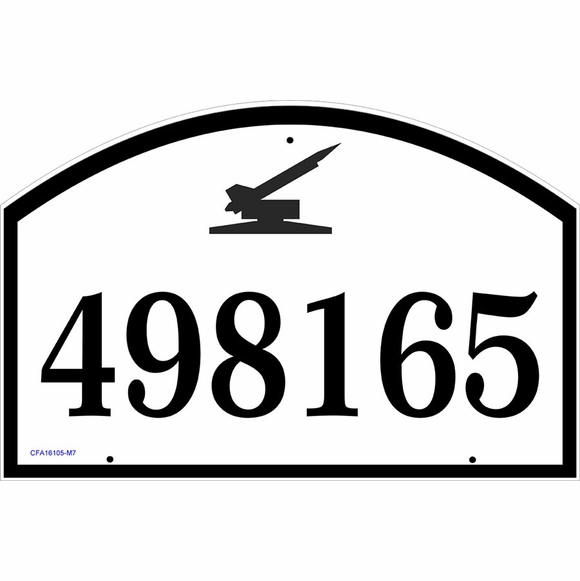 Address Plaque with Military Vehicles - - arch shape address sign personalized with your house number as well as the military vehicle shape, color, and size you select. Made in USA. Vehicle shapes include an armored radar tracking vehicle, a wheeled vehicle towing a cannon, a wheeled rocket launcher, a tracked long gun, a long gun, a rocket launcher, a tank, and a three ton truck. Perfect for a military specialist and their family members or friends. Two sizes: 12"W x 9"H and 16"W x 10.5"H.
The smaller 12" x 9" sign holds up to four (4) 3.5" house numbers on one line. The larger 16" x 10.5" sign can hold five (5) 4" or six (6) 3.5" house characters. Border is the same color as the personalization and accentuates the full arch shape. Dimensions: 12"W x 9"H x 1/8" and 16"W x 10.5"H x 1/8". Personalized wall mount military vehicle address sign designed especially for family members and friends of full time military specialists.